IRELAND . .Dungarvey . . The local hotel is filled with people of all ages - teens to old folks, who laugh, strut, converse, and relate joyfully across age boundaries without embarrassment. They seem to like one another. How can i stay in touch with young people,especially my own grandchildren? 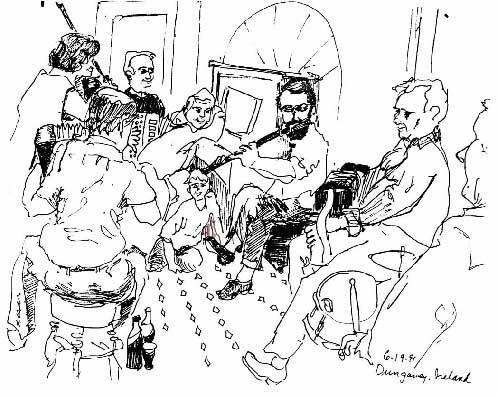 I stumble into a parlor, welcomed by these Irish musicians, who sing the stories of Ireland. I laugh and tap my feet, sketching, swilling Guinness stout. The accordion player suggests a route to Killarney where trees arch over the road, alongside a river with few hills. I'll go that way.